George Henry Martin lived at 45, Cranbury Road, Reading. 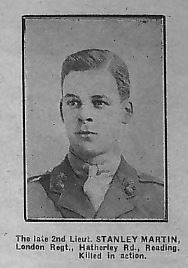 His death was notified in the Standard on 27th April 1918. 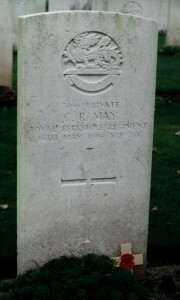 He died on April 3rd 1918, aged 23 years. He is commemorated on a family grave. His parents were George and Sarah Martin. George’s father was a painter and decorator and George Henry probably worked for him. His occupation as stated in the 1911 census was painters lad. George Henry Martin’s attestation papers are available. He attested on 29 January 1916. Upon enlistment his occupation was given as Crane Driver and driller. 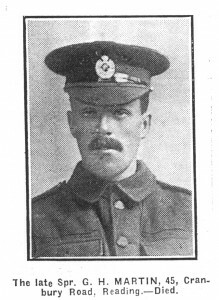 He had served 2 years in the 1/4 Royal Berkshire Territorial unit and tried to sign for overseas service in September 1914 but was not considered suitable due to flat feet and a weak right ankle. After attesting he was posted to the Army Reserve the next day and later to Royal Engineers. He served at home from from 21January 1917 until 2 February 1918 where he may have spent sometime working for Inland Waterways. On 2 February 1918 he was discharged as no longer fit for service although it is noted that he would have to attend a further medical examination. George Henry Martin suffered an accident whilst on duty on a barge when woden beams fell on him and severed his spinal cord resulting in paralysis of his lower limbs and requiring constant care. The author is carrying out further enquiries to establish whether he would be entitled to registration under the CWGC and would be eligible for a war pattern headstone. Sapper Martin is actually buried in the grave currently no information can be found as to his war record through the CWGC Internet site. Stanley Martin was the son of Charles Alfred and Maria Martin who lived at 22, Hatherley Road Reading. The home address in 1901 was the same as the caption on the photograph. 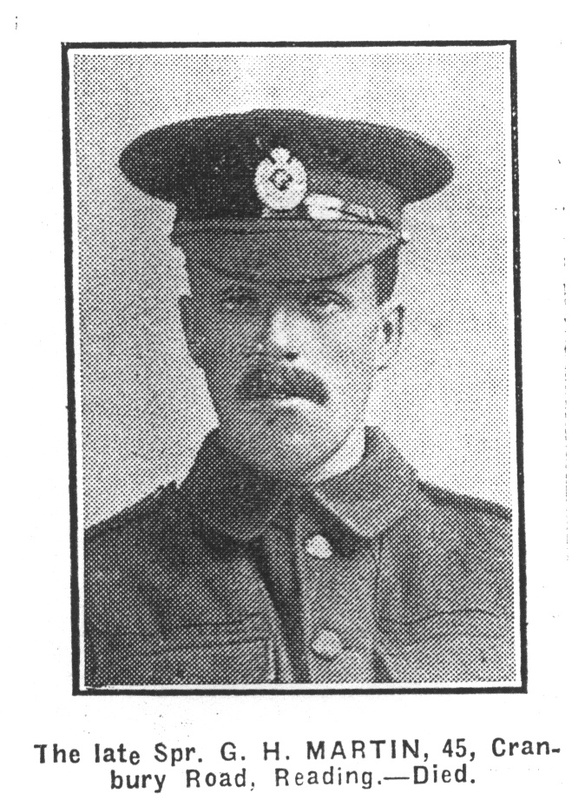 Charles Martin’s occupation was a cooper, by 1911he was a foreman cooper at the Huntley and Palmers Biscuit Factory. Stanley was the youngest of four children, he had two older sisters and an older brother. In 1911 he was still in school. He enlisted in 1914 in the 1st/4th Royal Berkshire Regiment aged 17½ and reached the rank of acting C.S.M. when he was recommended for a commission being promoted to the rank of 2nd Lieutenant with the Royal Fusiliers. 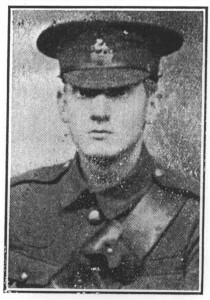 He was still with the 1st/4th’s when he received the Military Medal for “conspicuous good work in an attack on April 5th 1917. 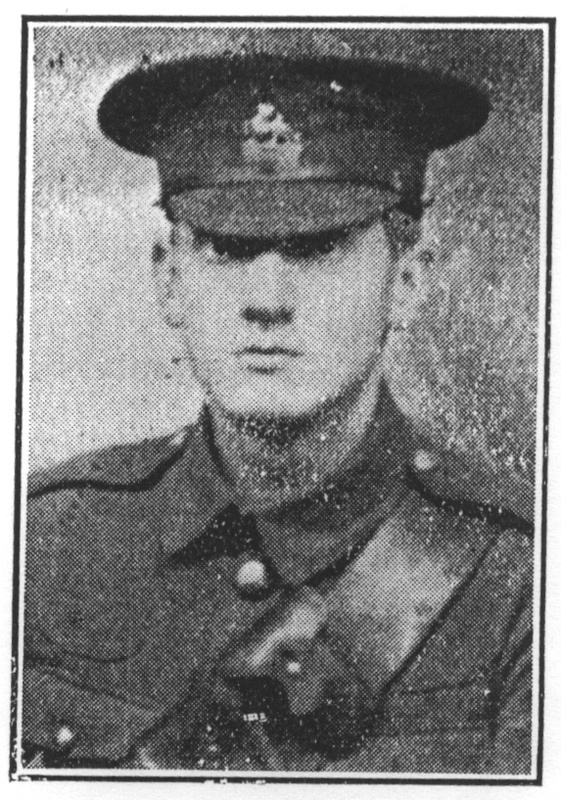 Details of the action were published in the Standard May 12 1917 in relation a Lance Corporal Herbert Degrucy of 29 Grosbrook Road, Caversham who, like Sergenant Stanley Martin was awarded the Military Medal for conspicuous good work. ‘During the attack on the villages of Ronssoy, Basse and Lempire, after the village was entered the company had to push on to link up with another battalion 1,000 yards through the village, and during the flight that ensued this N.C.O. showed great ability, being a great help to the C.O. he set a fine example and displayed great bravery and devotion to duty. Sergeant Stanley Martin, was awarded the Military Medal in connection with the engagement detailed above. 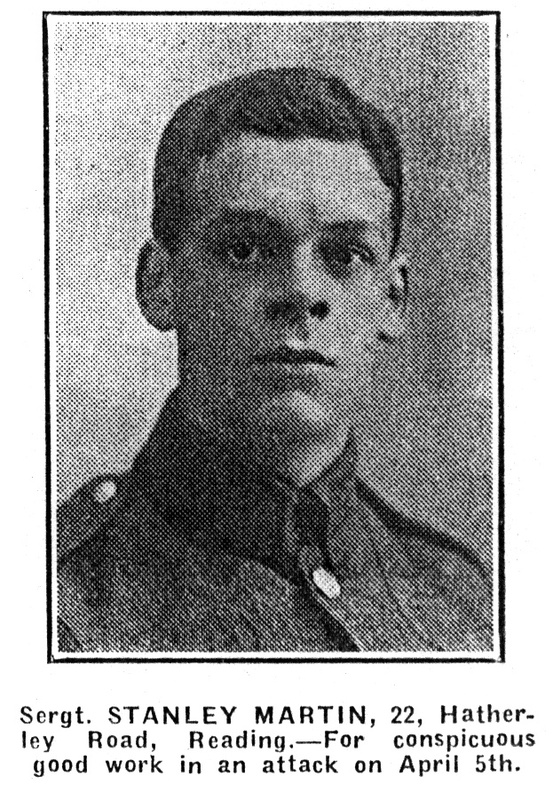 He was killed in action on September 18 1918 aged 24 years and buried at Ephey Wood Farm Cemetery, the Somme. The village of Epehy was captured at the beginning of April 1917. It was lost at the beginning of the spring offensive on March 22nd 1918, after a gallant defense by members of the 21st Division. British defenses were broken through on this day and the allies made a hasty retreat. The Germans claimed the taking of 16,000 prisoners and 200 guns. The village was retaken on 18 September 1918 in the Battle of Epehy, which started September 12 1918. The cemetery takes its name from the Ferme du Bois and Plots I and II were made by the 12th Division after the capture of the village, and contains the graves of the men and officers who died during the battle 18th September 1918. Cecil Rupert May is commemorated on his parents grave. He was the son of Frederick and Harriet May of 51, Market Place, Reading. It has not been possible to obtain information about Cecil Rupert May from Ancestry sources. 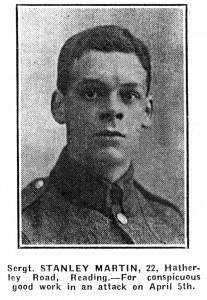 He was killed in action on 16th May 1916. Cecil May is buried in Hébuterne Military Cemetery, location I B 9. The 1st/4th Battalion Royal Berkshire Regiment were the first British Battalion to take over from the French. In May, the 1st/4th’s took over “G” sector, an area of unfamiliar and difficult ground near Tourvent farm on the outskirts of Serre. The ground was badly cut up with old trenches and shell holes and littered with bones from the fighting in June 1915. The communications trench was 1½ miles long and in a very poor state. Rations had to be brought up from Hébuterne. The front line was itself a salient which projected towards the strong German defence system around Serre. The line was defended with some difficulty using an arrangement of disconnected outposts. At 12.30 a.m. on the morning of 16th May a raid took place. The Germans had opened a violent bombardment on another sector around midnight on the left of the 48th Division. The guns of the 48th division responded to a false SOS and the Germans, after registering on the division guns, then directed heavy fire at the batteries. Across a frontage of 600 yards two platoons of the 1st/4th’s manned seven detached posts. The bombardment lasted half an hour and was directed at the front and supervision lines. At 1 a.m. the bombardment shifted to the support and reserve trenches with shells falling at a rate of a hundred per minute. “B” company in their outposts were over powered and half a supporting platoon of “A” company were destroyed in the bombardment. When the Germans finally made their attack the outposts were in such disarray that they managed to get in behind and attack the Berkshires from the rear. The attack, continued by German infantry until 1.40a.m. along different parts of the salient, and the bombardment went on all night until it stopped at dawn. Losses numbered 98, 18 killed and 29 missing, later most were reported as prisoners of war. ‘B’ company lost half its fighting strength. This was the first serious test for the 1st/4th’s and their endurance, discipline and fighting spirit were praised by the Divisional and Corps Commanders. Cecil May was killed during this action. Detail of this action are taken from the History of the Royal Berkshire Regiment by Petre and as written up in ‘The School,the Master,the Boys and the VC’ – the story behind the Alfred Sutton School War Memorial and the Great War 1914-1918.